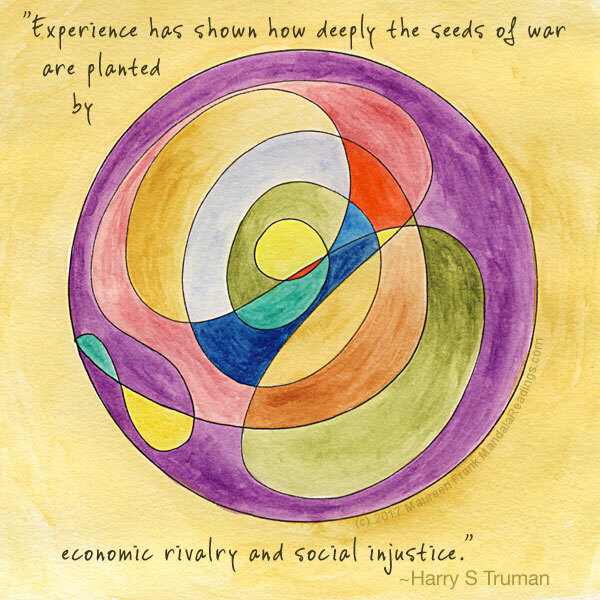 I begin my series of Mandala Mondays with the theme: Social Injustice. When I sat down to meditate for this week’s mandala, the song “Easy to be Hard” by Three Dog Night started playing in my head, in particular the lyric “who care about evil and social injustice”. From that I knew my theme. I proceeded to “doodle” this design and painted it all the while contemplating the theme and hearing that song playing continuous in my head. This mandala reminds us all to seek within ourselves what role we play in social injustice, both in relation to our own personal lives as well as within our community and world at large. what does social injustice mean to me? what does it look like in my personal life? what does it look like outside of my life? am I the victim of it or the victimizer … or both? what if anything am I doing to remedy it? Let’s ponder this as we go about our week.